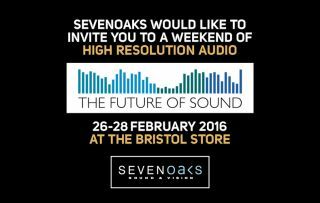 Experience hi­-res and MQA at Sevenoaks Bristol | What Hi-Fi? But have you actually experienced it? On a proper system? You really should. If you’re in Bristol for the Sound and Vision show between Friday 26th and Sunday 28th February, pop in to Sevenoaks Sound and Vision’s Bristol branch and have a listen. It’s a whole weekend of high-resolution audio. You can listen to hi-res music on kit from NAD and Bluesound, as well as learning how to convert your existing vinyl collection to hi-res files using the new Sony PS-HX500 analogue-to-digital turntable. And because Sevenoaks never stops giving, you might win stuff too: there’s a Bluesound Node 2 and Pulse Flex in the prize-draw, a chance to win back the price of any Podspeakers purchased over the weekend, plus free goodie-bags to everyone who attends. Don’t forget the show-stopping offers, available online and at Sevenoaks stores nationwide. Once your appetite has been whetted by all that hi-def goodness, you’ll want to fill your car boot with all manner of amazing hi-fi and AV kit at MQA-file-size prices. Turn up at the shop between 10am and 6pm on Friday or Saturday, or between 10am and 4pm on Sunday, and you’ll be in for a treat.